The colour/design of this product may vary to that shown. Please leave your picker a note of any preference. Standing, crawling, walking, running ­ being a toddler can be thirsty work, but this large insulated cup keeps drinks nice and cool so your little one stays happy and hydrated all day. Our clever flip up straw is guaranteed to save your little one (and everyone else) from a soaking, as they explore their new world. Chunky yet lightweight, with easy­grip sides, this is the perfect cup to encourage independent drinking as it's easy for your little ones to grab and sip. 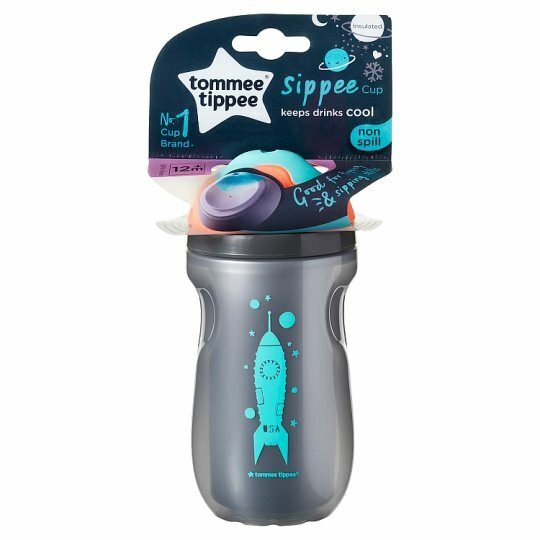 All Tommee Tippee cups have interchangeable parts, so no matter which lid or base you grab from the cupboard, everything will fit together. News Flash: Toddlers are messy And everything they touch gets messy too. But don't worry, this cup is easy to clean. The base and lid click apart easily and can be washed in hot soapy water or on the top shelf of the dishwasher. Your little one's gums can be highly sensitive, especially when teething, so our super soft spout is incredibly smooth and gentle in their tiny mouth. From 12 months onwards your little one will be crawling, walking and running around, so they'll need to start drinking more fluids. Our biggest Sippee Cup, which holds up to 260ml of liquid, is the perfect choice to keep active toddlers happy and hydrated all day. Insulated to keep drinks cool, this cup will encourage your little one to enjoy drinking so they stay hydrated. With a soft spout that's kind to little teeth and gums, easy-­grip sides, and a trusty two-piece, non­-spill valve it's perfect for drinking on the go.